Last year was a good year for K-pop fans because of all the events - concerts and fan meets - that fuelled their inner fangirls and fanboys. With all the announcements we've gotten and are still waiting for, it looks like 2019 is still going to be a year of saving up again so we could fund our concert tickets. 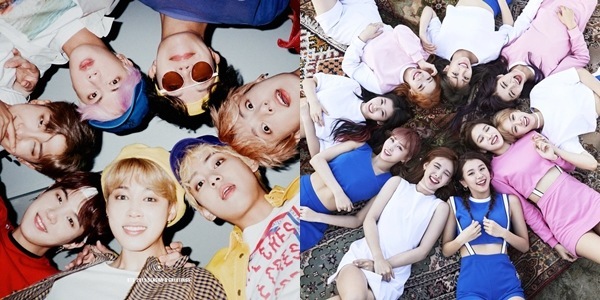 From rookies to fan-favorites, here are 12 K-pop boy and girl group we're adding to our wishlists this year! Did your ult make it to the list? Known to be the highest charting female K-pop act on the Billboard charts, BLACKPINK is a group formed under YG Entertainment back in 2016. They are composed of members Jisoo, Rosé, Jennie, and Lisa, and have released 2 mini albums: Blackpink and Square Up. They're currently on their BLACKPINK In Your Area World Tour 2019, with a stop here in the Philippines on February 2 at the Mall of Asia Arena. Songs We're Excited to Hear Live: "Ddu Du Ddu Du", "Boombayah", "Forever Young"
BTS, also known as Bangtan Sonyeondan, is a seven-member boy group who debuted under Big Hit Entertainment in 2013. The group is comprised of members RM, Jin, Suga, J-Hope, Jimin, V, and Jungkook, and has released 11 albums so far. They're also known for topping the charts with every release, their most recent one being Love Yourself: Answer, led by the title track "IDOL". The group is now on their BTS World Tour: Love Yourself Tour, with stops in the US, United Kingdom, Japan, Hong Kong, Singapore, Thailand, and more. Songs We Want To Hear Live: "IDOL", "Fake Love", "Answer: Love Myself"
TWICE is girl group formed by JYP Entertainment through the reality show "Sixteen". The group is composed of 9 members - Nayeon, Jeongyeon, Momo, Sana, Jihyo, Mina, Dahyun, Chaeyoung, and Tzuyu - and has released 2 full albums and 7 mini albums. Their most recent release was the repackaged album, "The Year of 'Yes'", led by the track "The Best Thing I Ever Did". The group is set to go on the Twice Dome Tour 2019 "#Dreamday", which will have dates in Osaka, Tokyo, and Nagoya. Songs We Want To Hear Live: "What Is Love", "Yes or Yes", "TT"
A group under SM Entertainment, EXO is a boy group with nine members including Suho, Baekhyun, Chanyeol, D.O. Kai, Sehun, Xiumin, Lay, and Chen. They made their comeback in November 2018 with Don't Me Up My Tempo, led by the title track "Tempo". It was later repackaged, with the title track "Love Shot". EXO performed in Manila last year as part of EXO Planet 4 – The EℓyXiOn, but EXO-Ls can already expect for the group to return here as soon as the details of EXO Planet 5 is announced. Songs We Want To Hear Live: "Love Shot", "Tempo", "Sign"
Another group from SM Entertainment, Red Velvet has 5 members - Irene, Seulgi, Wendy, Joy, and Yeri - and are known for their dual concept of releasing both pop and R&B tracks. Since their debut in 2014, the group has released 2 full albums and 8 mini albums, with RBB being the latest one. Red Velvet is currently on their REDMARE World Tour, which had shows in South Korea, Thailand, Taiwan, and Singapore. They're also set to perform in Japan, United States, and Canada this year as part of the tour. Songs We Want To Hear Live: "Bad Boy", "Russian Roulette", "Really Bad Boy"
GOT7 is a seven-member group from JYP Entertainment which consists of members JB, Mark, Jackson, Jinyoung, Youngjae, BamBam, and Yugyeom. They have released 3 mini albums and 8 mini albums so far since their debut in 2014. Their most recent album Present: You is led by the title track "Lullaby", and features solo tracks co-produced by every member. GOT7 had their Eyes On You Tour last year and will be embarking on the "Road 2 U" arena special which will be making stops in various cities in Japan. Songs We Want To Hear Live: "Hard Carry", "Lullaby", "Look"
Mamamoo is a girl group from Rainbow Bridge World with members Solar, Moonbyul, Wheein, and Hwasa. Known for their strong vocal performances and the concepts that go from retro to jazz to R&B, the group has already released 8 mini albums and 1 full album since their debut in 2014. Their most recent comeback was in last November with Blue;s, led by the song "Wind Flower". The 2018 MAMAMOO 4Season S/S Concert Tour was held last year in South Korea, Taiwan, and Hong Kong. Songs We Want To Hear Live: "Egotistic", "Wind Flower", "Decalcomanie"
Monsta X is a group under Starship Entertainment, formed through the survival show No.Mercy. It's composed of 7 members: Shownu, Wonho, Minhyuk, Kihyun, Hyungwon, Jooheon, and I.M. They have 2 full albums, 6 mini albums, and 1 compilation in their book so far, and are known for songs like "Shoot Out", "DRAMARAMA", and "HERO". They went on "The Connect" World Tour last year, which had stops in South Korea, Thailand, Hong Kong, Brazil, and more. Songs We Want To Hear Live: "Shoot Out", "DRAMARAMA", "Beautiful"
Formed by MLD Entertainment through the reality show Finding Momoland, Momoland has nine members: Hyebin, Yeonwoo, Jane, Nayun, JooE, Ahin, Nancy, Daisy, and Taeha. They've already released a full album and 5 mini albums, but their rose to fame happened after the release of the songs "Bboom Bboom" and "Bam"
The group will be having their fanmeet at the Smart Araneta Coliseum on January 25. Songs We Want To Hear Live: "Bboom Bboom", "Bam"
NCT, which stands for Neo Culture Technology, is a group from SM Entertainment whose concept is to have an unlimited number of members, which are then divided into sub-units based in different cities worldwide. As of now they have 21 members, and 4 sub-units - NCT U, NCT Dream, NCT 127, and WayV. NCT 127 will go on their 1st concert tour, NEO CITY - The Origin, which will have 2 shows at the Olympic Gymnastics Arena (KSPO Dome) in Seoul. Stray Kids is JYP Entertainment's rookie group, formed through a survival show of the same name. The group has 9 members - Bang Chan, Woojin, Lee Know, Changbin, Hyunjin, Han, Felix, Seungmin, and I.N.. While they only debuted last year, they've already put out 3 mini albums, as well as a pre-debut mixtape, and have already won 6 rookie awards. They'll be going on the Unveil Tour this year, with a stop in Manila on April 27 at the Smart Araneta Coliseum. They also have stops in Thailand, Malaysia, and Australia. Songs We Want To Hear Live: "My Pace", "I Am You", "District 9"
SEVENTEEN is a group under Pledis Entertainment which debuted in 2015. It has 13 members: S.Coups, Jeonghan, Joshua, Jun, Hoshi, Wonwoo, Woozi, DK, Mingyu, The8, Seungkwan, Vernon, and Dino and are known for being heavily involved in the choreography and the production of their songs. They made their comeback just recently with You Made My Dawn, led by the title track "Home". The group went on the Ideal Cut tour last year, which included a one-night show here in Manila. Songs We Want To Hear Live: "Don't Wanna Cry", "Home", "Oh My!" Homestream images taken from the group's official Facebook pages.